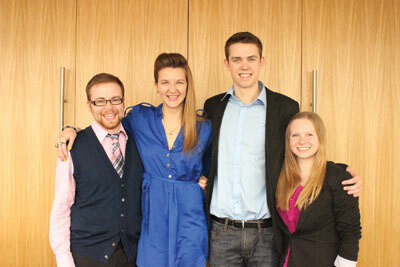 Your 2014-15 SAMRU executives are (L to R): Tristan Smyth, Zoe Slusar, Erik Queenan and Seija Roggeveen. It’s September already. I know it came quick and is seems like the summer just started, but here we are: a new semester, new classes, new people and new weather. As much as I will miss the summer, I am looking forward to the challenges and opportunities of the upcoming year. 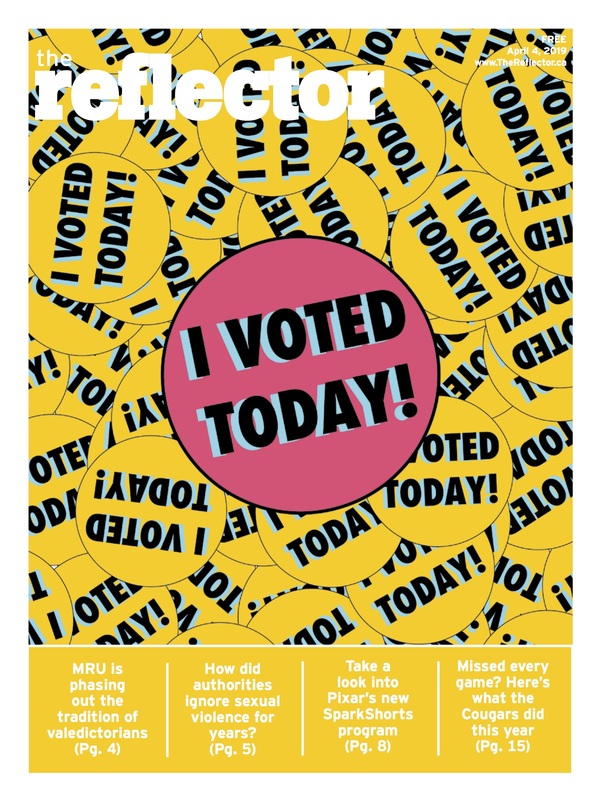 As a fifth year student at MRU and your Students’ Association President, I want to give you one easy practice that has helped me be successful. Make time for yourself. Daily. I don’t just mean working by yourself. It doesn’t take much, maybe only 15-20 minutes a day of consciously putting schoolwork, social drama, family or financial issues out of your mind and doing something that will help you recharge, whether it’s listening to music, going for a walk or reading a your favorite book. I wish you the greatest success this year. As the Vice-President Academic of the Students’ Association, most of my work occurs within Mount Royal and bringing the student perspective to the governance of the University, which includes advocating for ways of bettering students’ time here. From my experience, I find that there is pressure to perform at certain levels of excellence. Sometimes, it is explicitly stated by parents or professors, or sometimes, it is the implied demand of being an “A+ student,” which is like a unicorn. Instead of stressing about those standards, you should be asking yourself two questions: what do I want out of my education and what am I capable of? A successful university experience is equally about what you do in the classroom and what you do out of it, about the people you study and the people you meet and about what you learn and how you apply it. If grades come second to the extracurricular opportunities, then there is no shame in setting that as your goal. Likewise, aim for the GPA you want, whether that is a 4.0 or 2.1. Enjoying your time here is about setting your own standards of success, exceeding them, and then raising the bar higher. Welcome back! My name is Seija Roggeveen and I’m your elected VP External for SAMRU this year. My position as VP External ranges from advocating for students to the government with both the Council of Alberta University Students (CAUS) and the Canadian Alliance of Students’ Associations (CASA), as well as getting messages to the media about what MRU students are up to, allowing your voice to be heard. In my 4 years at MRU, I’ve learned some things that would make this year phenomenal. One of the best things you can do to make your studies both fun and rewarding is to get involved! For everyone, participating on campus means something different. Maybe for you it’s joining a club, playing intramural sports, becoming a student councillor, volunteering on campus, researching with your professors or just meeting up with a regular study group. Being active with this University’s community has made every year at MRU exceptional for me and I’m already anticipating another fantastic year at MRU! Welcome to MRU! My name is Zoe Slusar and I am thrilled to be your Vice President Student Life for the year ahead. Typically, students have the reputation of being drunk 20 year olds, but why is that all we get? My definition of ‘student’ goes way beyond parties. Being a student, for me, is about discovering personal identity. It’s about becoming who you want to be through exploration, challenges and engagement. The Student’s Association offers endless opportunities to get involved on campus through volunteering, clubs and events. We want you to find excitement in learning something new; because an inspired mind is a powerful one. There is so much to do in this big, wide world that it can be daunting. Take the necessary time to adjust. Allow yourself to experiment, to wonder and to question what you currently know. Embrace this year as an incredible opportunity to grow. You are powerful despite the pressure of balancing assignments, social anxiety and financial stress. Everyone struggles and if you find yourself in need of support, SAMRU is your back up. Remember to stay connected to the present moment and to who you are as a person. Use this year at MRU to expand both who you are as a student and as an individual. Live it up! Next story Parking perils… again!